Excellent quality Stiletto knife featuring a classic black and silver finish with polished bolsters and steel pins. Packing a 4 in. mirror polished stainless steel blade. Combines elegant style with great protection. 9 in. overall. Would have been nice to know their was no assisted opening. Quality knife, but hard to open if your in a hurry. Classy looking stiletto. I like the silver bolsters better than the gold, brass colored. I like the bayonet style blade. And I really love the lockback which is far superior to the liner lock style. Sure, I wish it was an automatic, but that's wishful thinking at $13. It’s a very nice pocket knife. It’s light weight and it feels very nice holding it. A really nice nice, well made and sturdy. Came really sharp with a polished look to the blade. Locks tight and blade doesn't move. I purchased this knife because I was looking for the style of 50s Switchblade,where I live switchblades are illegal.this is the perfect compromise between a switchblade and a perfectly legal pocket knife. It's well made. No blade play and locks tight. Beautiful blade, all shiny. Could use sharpening though but then you'd want to do it yourself right? I decided to take a chance on a $10 Tuesday deal and purchased the Kriegar German Stiletto Black Wood. The knife came out of the box sharp. It has a nice weight for a fairly small knife and feels good in my hand; small enough to be an EDC for me, but not so small that it will slip out of my hand. Craftsmanship is good for $10 blade, the blade locks into place reliably with each opening and the pressure release feels solid. When the blade locks out it feels "locked"! The blade is opened using a thumb groove that I find to be just a little close to the handle for smoothe, reliable opening; otherwise I'm very happy with my purchase. I'd recommend it, especially on a $10 Tuesday!! 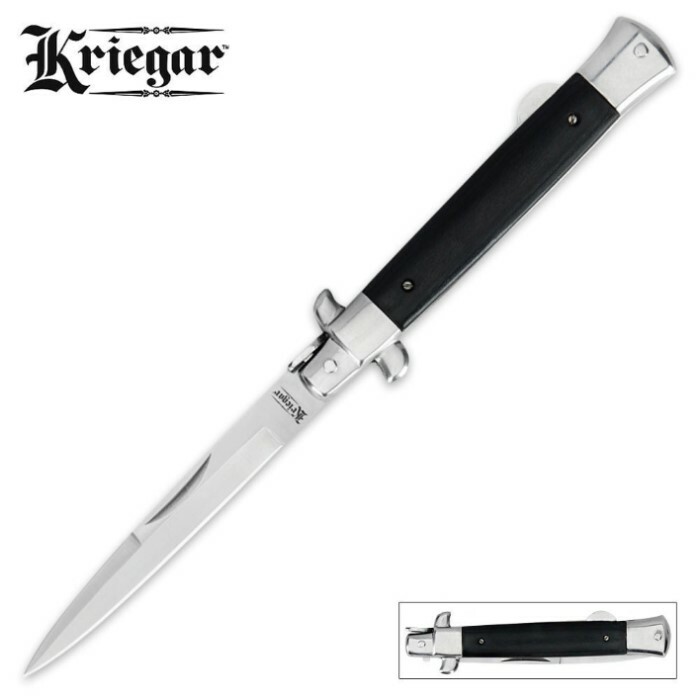 The Kriegar German Stiletto in black wood is a surprisingly well-made knife, as well as an attractive knife that is comfortable to hold in the hand. It's a classic lock-back design with a fingernail groove for opening, featuring thoughtful blade design and good materials. It's well worth the money if you're looking for a solid addition to your collection. Decent, good looking stiletto. It seems solid enough, locks up pretty tight once opened and out of the box came with a very sharp edge. Chinese made, but the overall quality is good, though imo, it's a tad overpriced. Being a stiletto, you're not going to use this for any serious cutting work. They just weren't designed/intended for that. It's a self defense knife intended for stabbing and thrusting that can occasionally be used to open letters and slice open taped packages. In that regard, this knife is perfect. Mine also has the "blood groove" the other reviewer mentioned, but thats not a deal breaker for me. Not quite as polished and perfect looking as the one Doug shows in the video, but its still nice looking. I think next time though, I'll go with a Kissing Crane as the fit and finish of their knives seems to be a bit better despite also being Chinese made. Overall though I like it a lot and I'm glad I got it.